PULLMAN, Wash. – Washington State University physicist Matthew McCluskey wasn’t trying to invent the next generation of material characterization microscopes, but when he couldn’t get the results he wanted from the best on the market, he improvised. Four years later, McCluskey launched Klar Scientific, a startup designing and manufacturing an innovative, new instrument that collects more information about materials in less time and at a lower cost than what is currently on the market. The company is the recipient of a $210,000 National Science Foundation Small Business Innovation Research grant to bring the affordable and easy to use microscope to market. For McCluskey, the journey to starting his own company began in 2012 while he was working in his laboratory in Webster hall. He was studying miniscule defects on the surface of a sample with a confocal microscope, an instrument scientists use to investigate a variety of organic and inorganic materials. He was having a hard time gathering enough data with the tool so he decided to replace it with a custom-built microscope that used an off-the-shelf digital CCD camera instead of the more expensive light detector and optics used in conventional confocal microscopes. His invention quickly proved to be a much more efficient way to gather data. Not only did it provide high resolution images of the nooks and crannies on the material’s surface but it also cost less than a conventional confocal microscope. A new kind of confocal microscope being developed by WSU faculty collects more information about materials in less time and at a lower cost than what is currently on the market. University researchers and other scientists working in laboratories for companies like Samsung and General Electric use confocal microscopes to make sure there are no material inconsistences or defects in electronic, optoelectronic, and structural devices, as well as coatings, tubing, devices, disks, and specialty mirrors. McCluskey realized he had developed something novel that might be of use to them, so he contacted the WSU Office of Commercialization for help. The Office of Commercialization collected market data to see if there was anything like McCluskey’s invention out there and helped him file a patent. McCluskey then contacted Brian Kraft, director of business development for the College of Arts and Sciences, who worked with several of his graduate student fellows in the Scholarly Knowledge, Innovation and Leadership Development (SKILD) program to help support McCluskey’s efforts to attract funding for development of the microscope. 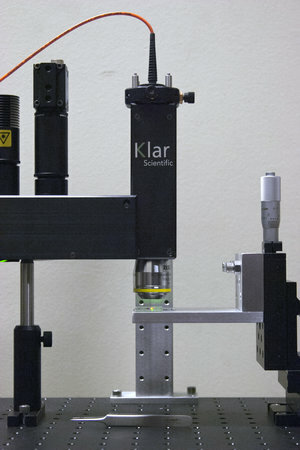 McCluskey then applied for and received funding from the WSU Commercialization Gap fund to develop several working models of the new microscope and teamed up with Rick Lytel, an adjunct physics professor and startup specialist based in Silicon Valley, to form Klar Scientific. The two researchers participated in WSU’s 8-week Innovation Corps program where they received financial support to meet with industry experts and potential customers to get feedback on their product. Earlier this year, Klar Scientific was awarded the National Science Foundation grant to incorporate what McCluskey and Lytel found from their consultations with corporate and university scientists into a new and improved product. McCluskey and Lytel recently recruited a former PhD student to help them integrate their microscope’s topographic mapping capability with a diverse set of spectroscopic tools that normally require additional and expensive instrumentation. The team has set up shop at the WSU Research and Technology Park in Pullman to finish up their development work over the spring. A study describing their new microscope is published in the online journal PLOS ONE.